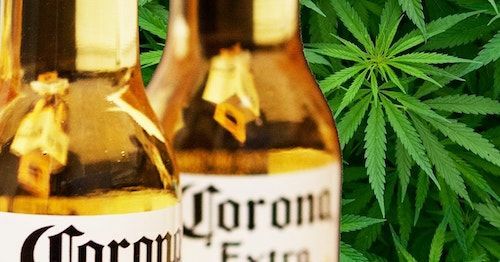 Constellation Brands, the liquor giant behind Corona and Modelo, has spent over $4 billion to own a third of Canopy Growth, a leading cannabis company. The deal – the biggest cannabis investment to date - promises to reveal whether consumers will cut down on alcohol in favour of marijuana or continue buying both. Canopy’s bosses believe their international production facilities, big brands, intellectual property and retailing chops, combined with Constellation’s expertise in sales and marketing, mergers and acquisitions and finance, will allow the company to capture a lion’s share of the burgeoning cannabis market, forecast to triple in size to $32 billion by 2022. The company has already secured more than a third of all supply contracts for recreational cannabis in Canada, as well as prime retail sites in Ontario for its Tokyo Smoke and Tweed brands, ahead of the drug’s legalisation on October 17th. It’s also well-placed to profit if the US government gives marijuana the green light. One important question for Constellation is whether consumers will shift their spending away from alcohol towards cannabis once it’s legalised. The research on whether cannabis complements or substitutes alcohol remains inconclusive: a RAND report of marijuana legalisation in Vermont found mixed evidence, while an academic study discovered that college students who drank more tended to use more pot, but also revealed that those who relied on alcohol and drugs to cope were less likely to smoke weed as they drank more. One working paper found that monthly alcohol sales fell almost 15% in US states where medical marijuana was legalised, suggesting consumers smoked pot instead of buying alcohol, but its findings can't be generalised. Constellation CEO Rob Sands insists the company’s beer, wine and spirit sales won’t be hurt. “We see no evidence whatsoever…of alcohol cannibalisation” in the US states where cannabis is legal, he told analysts on the company’s latest earnings call. Indeed, wider availability of the drug hasn’t dented Constellation’s growth so far: its beer sales rose a tenth and wine and spirit revenues rose 9.3% in the three months to the end of August. Nonetheless, Constellation’s competitors will be watching closely as it throws its weight behind Canopy and introduces cannabis-laced drinks. Several have already taken the plunge into pot: Heineken-owned Lagunitas Brewing launched Hi-Fi Hops – a pair of non-alcoholic drinks infused with THC (the active ingredient in cannabis) and a mix of THC and the non-psychoactive cannabidiol (CBD) respectively - this summer, while Molson Coors recently partnered with weed supplier Hydropothecary to develop similar drinks for the Canadian market. Constellation’s investment in Canopy allows it to take a hit of the weed-industry bong and hedge against a possible slowdown in booze sales. However, it risks undermining its core business if cannabis does crowd out alcohol. Whether Constellation has made a drinking buddy or invited a bad hangover will become clear soon.